We have been amazed by reports of a bizarre animal thought to have been extinct suddenly surfacing in the Albany Pine Bush during the past month. 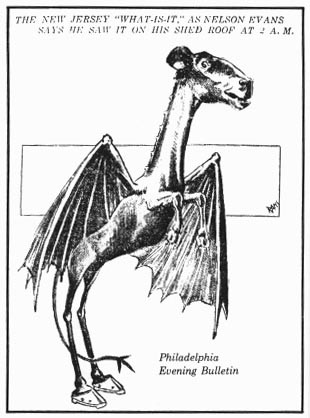 The so-called Jersey Devil, which was native to the pine barrens of southern New Jersey, has not been seen there since the 1950's, although it's tracks had been found up until the late sixties. If these recent sightings are confirmed, then we have another rare and very endangered species alongside the Karner Blue Butterfly in the Pine Bush. Like the rarely seen coyotes that inhabit the Pine Bush, it is a predator that prefers to hunt at night. Several half eaten deer carcases may have been found in isolated spots in Guilderland and Colonie, which perhaps bear the marks of a Pine Bush Devil attack. Odd footprints were found near the kills, a sort of cloven shape with what appear to be sharp claws. It is certainly a hard animal to classify. The body of the animal is about the size of a german shepard, with a head that is variously described as dog-like or horse-like. When grounded it tends to stand erect on long thin hind legs, and has a long rat tail. It sports a pair of leathery wings more commonly found on certain types of bats, and usually gets about by flying in short hops, although it can move fast. So far, no humans have been directly endangered by the creature, other than the alleged story of an elderly man strolling behind the Daughters of Sarah Nursing Home, who was startled by a hissing airborne animal, apparently the Pine Bush Devil, which flew directly at him and veered off at the last moment. We would appreciate any further reports, real or otherwise, of the Albany Pine Bush Devil lurking among the sand dunes, or perhaps in your back yard. Recently seen in the Albany, NY Pine Bush?! ?